Are there any new cameras worth of stacking the claim of the best compact cameras under $300? Let’s find out! Off late, compact systems haven’t been the focus of manufacturers as they are looking to woo new customers with the power of DSLRs. Plus, with the advent of dual (and now triple) camera systems on smartphones, compact cameras are being pushed to the sideline. Yet, there is a certain charm with small compact cameras. I mean proper cameras i.e. the smartphone camera is not a proper camera. You don’t have (yet) a zoom lens. Yes, some of you will contradict and say dual lens systems somewhat achieve that ability to zoom. But then, these are dual fixed lenses and not a zoom lens which gives you a range of focal length to choose from. Enough said. Let’s not delay this any further. So, here are the best compact cameras under $300 in 2018. The Canon SX710 HS is no longer available. It was one of the best compact cameras in the mid-range segment. It has now been replaced by the even better PowerShot SX740 HS. But the price of the new camera is almost close to $400 and thus has been kept outside the purview of this discussion. So is the next model – the SX730 HS. We take the next best option – the PowerShot SX720 HS as our choice as this one fits the budget constraints. Though this particular camera is no longer available on the Canon online store and is clearly stated as discontinued on the B&H web-store. But the camera is available on Amazon and retails at just a shade under $300. You can opt for either the Red or the Black versions at just about $250. This camera is powered by a 1/2.3” CMOS sensor with a resolution of 20.3 effective megapixels. Paired with it is a DIGIC 6 image processor. It comes with a built-in lens that gives a 35mm equivalent focal length of 24 – 960mm. That translates into a 40x optical zoom. The aperture range of the camera is f/3.3 – f/6.9. But do consider the smallness of the sensor when you read the specs. Small sensors such as these are not so great when shooting in low light situations. Just like all compact camera systems, the PowerShot SX720 HS lens too comes with a macro mode which works at a minimum working distance of just 5 cm. It lets you capture images of small objects and creepy crawlies. Finally, the PowerShot SX720 HS has a useful video mode too which shoots full HD videos at a frame rate of 60/30 fps with crisp audio recorded via the built-in mic. The other features include a 3” rear LCD screen with a resolution of 922,000 dots, built-in Wi-Fi and a pop-up flash. Power comes from a 1250 mAh Li-Ion battery. We also include the Canon PowerShot SX620 HS in this discussion. It replaced the older SX610 HS. The form factor and the design remains close to the outstanding model. Though the outgoing model is slightly longer and slightly thinner than the new model. The PowerShot SX620 HS is powered by a 1/2.3” BSI CMOS sensor with an effective resolution of 20.2 megapixels. Nothing out of the ordinary here. It is paired with the DIGIC 4+ image processor. The sensor and the processor combination is what makes up Canon’s HS system. This is basically a way to capture low noise imagery in low light situations. It also helps in the quality of the imagery in bright light. Compared with the older SX610 HS the SX620 HS has a slightly longer lens. The only major difference between the otherwise identical features as the predecessor. The SX620 HS has a 35mm format equivalent focal length coverage of 25-625mm. The maximum aperture of the lens is f/3.2 in wide angle and f/6.6 in telephoto mode. The lens features optical image stabilization. Optical image stabilization is helpful because it helps to get a more stabilized shot when working at the lens’ longest focal length. Just like most other compact cameras in the business, the SX620 HS comes with macro mode on its lens. The closest working distance is 1 cm. The SX620 HS shoots decent enough videos, especially when you are with friends and family and need a reliable camera to record some happy moments for posterity. The camera has full HD support and captures at a maximum of 30 fps. What we don’t like is the monaural sound recording which is a bit of a deal breaker. An interesting feature of the camera is the Hybrid Auto Mode. This mode has come down from the previous SX610 HS. This mode is like a built-in daily record of sorts. Every time you press the shutter with this mode on it will record between 2 – 4 seconds of video before the actual still is captured. At the end of the day, all the images and videos are then compiled together to form a digest type video. It is a very cool feature of the camera. The other features of the camera include a 3” LCD screen (no touch functionalities) with a resolution of 922,000 pixels, built-in Wi-Fi, and a built-in pop-up flash. The Nikon Coolpix A900 is a powerful compact camera. Everything that you would come to expect out of a But the powerful 20-megapixel sensor and the decent lens helps it find a position on this list of the best compact cameras under $300. 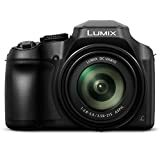 You can find this camera on Amazon for much less than $300. This is one of the few cameras that offer full manual exposure control. Under the hood, the Coolpix A900 has a 20 megapixel 1/2.3” BSI CMOS sensor. BSI sensors are capable of low light shooters with suppressed noise performance. The built-in fixed lens has a focal length range of 24 – 840m (35m format equivalent). That’s 35x optical zoom. The maximum aperture of the lens is f/3.4 in the wide end and f/6.9 on the long end. Additionally, the lens includes ED (extra-low dispersion) element which ensures that chromatic aberrations (purple fringing) are suppressed. The Coolpix A900 has a macro mode which allows the camera to focus from a minimum distance of 50cm when shooting in wide mode and a minimum of 2 meters when shooting in telephoto mode. The Coolpix A900 is capable of shooting UHD 4K videos at a maximum frame rate of 30 fps. The camera has built-in Bluetooth technology which facilitates faster / seamless transfer of videos and images to other compatible devices. It also has built-in Wi-Fi and NFC again for wireless transfer of images and videos quicker pairing. At the back of the camera is a 3” 921k-dot tilting LCD screen. The PowerShot SX530 HS is probably one camera that you would pick only for the purpose of its lens. Those who prefer a long lens, I mean a really long lens, the PowerShot SX530 HS has a 1200mm (35mm format equivalent) lens. Though it is not the usual ‘compact’ form that you would find elsewhere, this is a very powerful camera. Let’s find out more about its features. Powering the SX530 HS is a 16 megapixel 1/2.3” HS CMOS sensor. Paired with it is a DIGIC 4+ image processing engine. The lens is the standout feature of the camera. In 35mm terms, the lens has a focal length range of 24 – 1200mm. That’s a whopping reach and you can fill the frame with the moon with this or satisfy your voyeuristic urges (not recommended). And if that incredible optical zoom isn’t enough there is an additional 4x digital zoom. I am not a big fan of digital zoom and hardly ever use that. Image stabilization is a must-have for a camera with such an incredible focal length and the SX530 HS has Intelligent IS Image Stabilization (optical). In the wide macro mode, the camera can shoot from a minimum focusing distance of 1 cm. The SX530 HS shoots full HD videos at a frame rate of 30 fps. The movies are encoded in AVC / H.264 and the format of movies is web-ready MP4. The other features of the camera include built-in Wi-Fi and NFC, a 3” 461-k dots LCD monitor and pop up flash that is positioned slightly better than most other built-in flashes that we have seen. The SX530 HS has a similar feature as the SX620 HS. The SX530 HS would take a small video clip (2 seconds) when you press down the shutter button to take a still. At the end of the day, all these still images and 2-second videos will be compiled together to form one video file. This functionality is known as the hybrid automatic mode. The Nikon Coolpix B500 was one of our top choices the last time. Now with a price tag that has come down significantly, the camera remains as relevant as ever. The most striking thing about this ‘bridge camera’ is its 40x super optical zoom. The B500 is powered by a 1/2.3” BSI CMOS sensor with 16 effective megapixel resolution. Two things that are relevant, the sensor is BSI technology equipped and that means acceptable shots in low light. Truly, the 40x optical zoom makes this camera truly irresistible. Though there are other options in hand, now than it was a couple of years ago, the B500 is cheap. The 40x optical zoom translates into a 35mm format equivalent focal range of 22.5 – 900mm. That’s phenomenal. The maximum aperture range of the camera is f/3 – 6.5. There are three ED elements in the construction of the lens. This suggests that the lens will not suffer too much from chromatic aberrations. Vibration reduction is built-in which ensures that the camera is able to prevent small hand movements from blurring the images. The camera can shoot macro photos (in wide macro mode) at a minimum working distance of 1 cm. The B500 is capable of shooting full HD videos at a maximum of 30 fps. Video mode comes with a 4-axis hybrid image stabilization mechanism which ensures that you can capture stabilized videos even when the camera is hand-held. The B500 has an array of connectivity options. It has NFC for faster pairing and comes with built-in Bluetooth and Wi-Fi. It has a 3” LCD screen with a resolution of 921,000k dots resolution. There is a built-in pop-up flash as well. The Sony Cyber-shot is a slightly dated camera. But it is still going strong. Thanks to the higher resolution sensor and the fact that the sensor is paired with Sony’s BIONZ X image processing engine. BIONZ X is an excellent image processor for producing suppressed noise performance in low light imagery. The sensor inside the DSC is an 18.2 megapixel 1/2.3” BSI CMOS unit. The sensor is capable of producing large fine JPEGs (4896 x 3672 pixels) and full HD videos at 60 fps. The built-in lens on the DSC WX350 has a 35mm focal length range of 25-500mm which is basically 20x of optical zoom. The maximum aperture range of the camera is f/3.5 – 6.5. The lens features Optical SteadyShot image stabilization. There is a macro mode, though it is not as effective as some of the cameras that we have discussed here. The minimum focusing distance is 2.00 meters in telephoto mode and 4.88 cm in wide mode. As detailed above the camera is capable of recording full HD videos. The maximum frame rate is 60 fps. The maximum clip length is only 29 mins. You can record stereo + mono audio recording with the videos. The back of the camera is dominated by a 31” LCD screen with a resolution of 460,000 dots. We don’t quite like the low res display. Can’t help though as this is a slightly dated camera. That said it has built-in Wi-Fi and NFC for faster pairing when you need to transfer images and videos out of the camera to a smartphone or tablet. We are replacing the Panasonic Lumix DMC – ZS50 with the Lumix DC-FZ80. This one has a higher resolution sensor and a longer optical zoom range. It also has 4K shooting capabilities compared to full HD of the outgoing model. Plus the added embellishments. Additionally, the look and feel of the camera definitely put that in the bridge segment. The Lumix DC-FZ80 has an 18.1 megapixel 1/2.3” MOS sensor. The camera is capable of producing both JPEG and RAW images of the size 4896 x 3672 pixels. One of the rare cameras in this segment that has RAW support. The built-in lens has an optical zoom range of 20mm all the way to 1200mm. That’s a pretty long optical zoom range for any camera. Thanks to the presence of POWER O.I.S. The maximum aperture of the lens is f/2.8 to f/5.9. There are two macro modes on the camera, wide macro and tele macro. In the wide macro mode, the camera is able to focus from a minimum working distance of 1 cm. In tele macro mode the camera is able to focus from a minimum working distance of 150 cm. The Lumix DC-FZ80 is capable of recording 4K (UHD). One of the rare compact cameras under $300 that offer that functionality. That makes the Lumix DC-FZ80 a prime candidate for the title of the best compact camera under $300. The maximum frame rate is 30 fps. At full HD (1920p) the maximum frame rate is 60 fps. Maximum clip length is 29 mins and 59 secs. The camera has a built-in mic which will pick up stereo sounds. Another interesting feature of the camera is the small (1.166m-dots) electronic viewfinder at the back of the camera. The viewfinder gives 100% frame coverage. The rear LCD screen also gives 100% frame coverage and it offers a resolution as good as any other camera on this list. The resolution is 1040k-dots. An extra stand out feature of the camera is the ‘Post Focus’ option. This allows the camera to adjust focus after the image has been made. This is not the same thing as a light field camera. Finally, the camera has built-in Wi-Fi. This allows for the camera to transfer images and videos straight from the camera to your smartphone/computer. Backing up or sharing images is thus much easier. The Kodak PIXPRO is a bridge camera that combines the design format of a DSLR camera and the convenience that comes with using a compact point and shoot camera. At the end of the day, the PIXPRO AZ652 is a compact camera. Uncomplicated. Powering the sensor of the Kodak PIXPRO AZ652 is a 20.68 megapixel CMOS chip (1/2.3” CMOS) with BSI technology. BSI technology ensures that the camera is able to capture reasonably noise-free images even in low light situations. The built min lens has a 65x optical zoom. That’s a fantastic zoom range. In 35mm terms that is the equivalent of 24 – 1560mm. It is incredible what you can do with that amount of reach. Optical image stabilization is important in this situation and the PIXPRO AZ652 has that. Maximum aperture of the lens varies between f/2.9 to f/6.7 from 24 to 1560mm. The vast focal length range gives you an incredible reach which you can use to shoot wildlife, birds, action sports and anything in between. Macro mode on the camera allows the lens to focus from a minimum distance of 1 cm. Normal focusing in wide mode will let the lens focus at 50 cm, while in a telephoto mode it is 2.50 meters. The PIXPRO AZ652 can shoot full HD videos at a maximum frame rate of 60 fps. You can obviously change the frame rate or shoot at a lower resolution. Not recommended though. The camera has a built-in stereo mic capable of recording crisp sound. The other features of the camera is an electronic viewfinder and a 3” rear LCD screen which gives a 920k-dots resolution. The camera has built-in Wi-Fi which ensures that you can transfer images and videos over a wireless connection. Are the writers of these articles English-speaking professionals? If they are, why do I constantly encounter numerous spelling and grammatical errors in litlerally every single article? I am no computer expert but I do have some techinical writing experience, and If I submitted work with the type of errors which are consistent in your articles, I would not have had my job for long. Ever heard of Spellcheck or Grammarcheck?